Salam. Please find some brief notes and download link for this Qasidah. I have a commentary on it by Shaykh Hasnain Muhammad Makhluf (one of the famous Azhari scholars) somewhere which I haven’t had the opportunity to refer to for the post below. He is Yusuf bin Muhammad bin Yusuf, Abul Fadl known as Ibn al-Nahwi al-Tawzari. He was born in Tawzar in the southern Yunisa in the year 1042 Hijri. He studied with a number of the scholars of his time not least the jurists (fuqaha) such as Abul Hasan al-Lakhami, his Shaykh al-Ma’zari and likewise al-Shaqratasi. After Abul Fadl completed his travels in the pursuit of knowledge he returned to his hometown of Tawzar, but had to leave it due to the oppression of the ruler of that place. He therefore lived in different cities of Algeria and Morrocco teaching grammar, jurisprudence, principles of law, tenents of faith whilst at the same time traversing the path of self purification and abstinence. 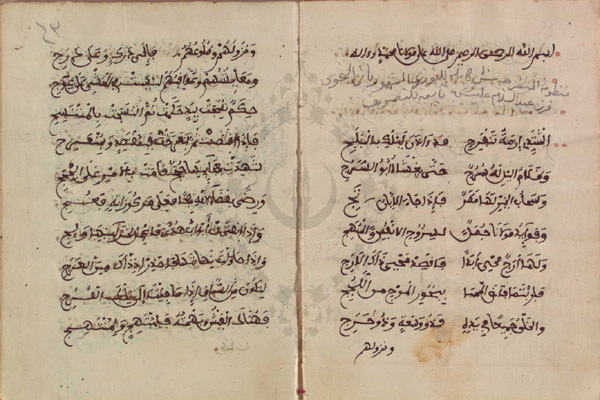 His students included Qadi Musa bin Hammad al-Sanhaji, Abu Muhammad Abdullah bin Suleiman al-Taharti and Ibn al-Ramamah the Mufti of Fes. He was known for his piety and became well known for his mastery of jurisprudence. Along with this efficacy of his supplications (dua) was attested to such that it was said by some: I seek refuge in Allah from the supplication of Ibn al-Nahwi! The ruler saw a dream which troubled him and resulted him in halting his acts of oppression whilst admitting to his sins. He instructed that this mans wealth be returned because he saw in his dream the Prophet (Allah bless him and give him peace) who said: Send to Abul Fadl bin al-Nahwi in the masjid known as such in Algeria, and carry out what he orders. The Khalifah did this and sent someone in search of him. When he entered and found him he said: What is your need O Abul Fadl? He infomed him of his order and wrote for him to return of all that he had been informed about. Then he was asked: What is yor means with the Messenger of Allah? I recently came across its Urdu translation and explanation by Maulana Abdullah Abbas Nadwi ra. It is accompanied by an introduction by Shaykh Abul Hasan Ali Nadwi rehmatullah alehey. It is titled ‘Taseli ka saman’ alma’ruf bih ‘Masaib ka madawa’. Published by Darul huda, Urdu bazar, Karachi. Do you have the English full Qasidah al-Munfarijah.? as we sing this in our Tariqah.